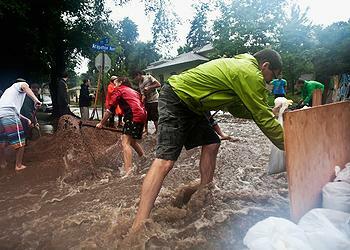 BOULDER, Colorado, September 13, 2013 (ENS) – Four people have died and at least 80 others are unaccounted for today as heavy rain adds to the flood waters that have forced the evacuation of some areas of Boulder and several nearby towns. 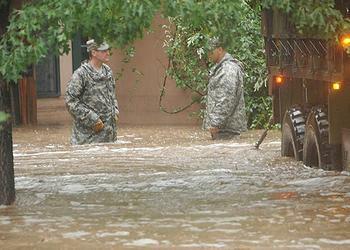 The National Weather Service said Boulder has had 13.55 inches of rain since the storm began. Torrential rain and flooding is affecting a 150-mile stretch of the state’s Front Range. Boulder officials today found the body of a woman who was washed away; Thursday they recovered the body of her male companion. 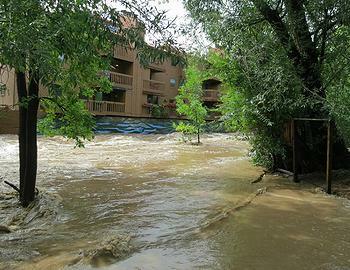 The two 19-year-olds died in flooding on Linden Drive in Boulder. Officials have not yet released their identities. Also officially unidentified as yet is a man who was killed in the collapse of his home in the mountain community of Jamestown. And in Colorado Springs police found the body of a man in Fountain Creek, who they identified as Danny Davis, 54. Evacuation orders are still in place for western Boulder, Eldorado Springs and Lyons today as residents and officials begin to take stock of the damages from the past three days of historic flooding. In Boulder, officials issued emergency alerts to 8,000 residents along Boulder Creek, warning them to find shelter elsewhere. About 4,000 residents along Boulder Canyon were ordered to evacuate as officials worry that mud and rocks piling up in Boulder Canyon will be suddenly washed away, causing a sudden surge in water downstream. Last night, President Barack Obama declared an emergency for three counties in Colorado – Boulder, El Paso and Larimer counties – and ordered federal aid to supplement state and local responses. The declaration makes direct federal assistance immediately available to save lives and to protect property and public health and safety in areas of Colorado affected by the severe storms, flooding, landslides and mudslides. The Federal Emergency Management Agency, FEMA, has an Incident Management Assistance Team and a liaison officer on site at the Colorado emergency operations center to coordinate with state and local officials to identify needs and shortfalls impacting disaster response. An additional Incident Management Assistance Team is also en route. Colorado-Task Force 1, a federal urban search and rescue team, is on the ground to support search and rescue operations in hard hit areas. Because of flood waters, loss of power and road damage there is no safe access in or out of Lyons, a town 17 miles north of Boulder. The Colorado National Guard is conducting a voluntary evacuation of Lyons, transporting residents with tactical vehicles to LifeBridge Church in North Longmont, about 11 miles to the east. The city of Longmont is bisected by the St. Vrain River. Main Street/U.S. 287 is closed from Missouri Street south to Plateau Road along with other primary north/south arteries. Eldorado Canyon and St. Vrain State Parks, as well as the Watson State Fish Hatchery, are closed and have been significantly impacted. Nearly 100 Colorado National Guard soldiers and airmen with high-mobility vehicles and helicopters have been mobilized to assist local authorities in search-and-rescue operations in the midst of this historic flooding. Colorado Governor John Hickenlooper and various cabinet members visited flooded communities today in Boulder, Larimer and Adams counties. According to the National Weather Service, flooding advisories remain in effect for several areas in Colorado, and severe weather is in the forecast through the weekend in some areas. It may take several days or longer for river levels to crest and begin to recede. Over nine inches of rain has been recorded by the National Weather Service as of Friday morning in Colorado Springs, nearly 100 south of Boulder. More than eight inches of rain fell across some parts of Boulder on Wednesday, causing massive flooding within the city. Jane Brautigam, the city’s manager has signed and issued a local disaster and emergency declaration for the city of Boulder on Thursday afternoon, according to the Boulder Office of Emergency Management. Flood sirens continue to sound across Boulder today and helicopters are on patrol as an inch of rain per hour fell in some areas. All the area creeks have overflowed including Boulder Creek. The Cottonwood Trail is flooded and railbeds have been washed away. Rising flood waters have made many roads impassible, and some drivers trapped in their cars have had to be rescued. At least one house has collapsed. All Boulder County parks, trails and open spaces are closed until further notice. The University of Colorado’s Boulder campus closed Thursday and remains closed today as rain continues to fall and more storms are expected through tomorrow. All campus events have been canceled. With the current weather conditions and the continuing possibility of flash flooding, the evacuations of the Faculty/Staff housing unit, Athens Court and the ground floor of Newton Court will remain in place. The university has evacuated several buildings including the faculty-staff housing unit, which has impacted 220 units and 355 family housing residents. “With the weather conditions continuing to be unpredictable, we’re going to exercise caution and keep the current evacuation in place,” said Chancellor Philip DiStefano. Dozens of staff members from across the campus, including housing, facilities management and public safety, have been working since Wednesday evening to restore and preserve campus facilities. The current assessment is that 25 percent of campus buildings have some form of water damage, such as seepage in basements. The Colorado Department of Natural Resources says major Front Range dams, including those associated with Denver and Boulder, are performing well. Some small dams associated with fishing and stock ponds are overtopping or failing. State engineers are visiting many dams to evaluate vulnerabilities. The Niwot Sanitation District is currently at capacity and water managers are asking all residents to minimize use of water for the next 24 hours. “We are asking everyone to stay out of the flood water. Even if it looks clean do not wade in, play in or go near the water. The water likely contains sewage, bacteria, and debris,” sanitation officials warned. The Colorado Department of Transportation has closed highways in areas of Denver, portions of northern Colorado and points west of the Front Range due to flooding, and rock and mudslides. Flooding has closed I-25, the state’s primary north-south highway, from north of Denver to the Wyoming border. Today crews were able to reopen U.S. 36 in both directions between Boulder and Denver. Due to the amount of saturation and possible unstable conditions of state highways, CDOT advises motorists to avoid travel unless absolutely necessary in Boulder, Larimer, Weld, Jefferson, Clear Creek and Gilpin counties.